Do the frivolous sidequests detract from the gameplay at all? Hell no. It's actually somewhat of a relief. 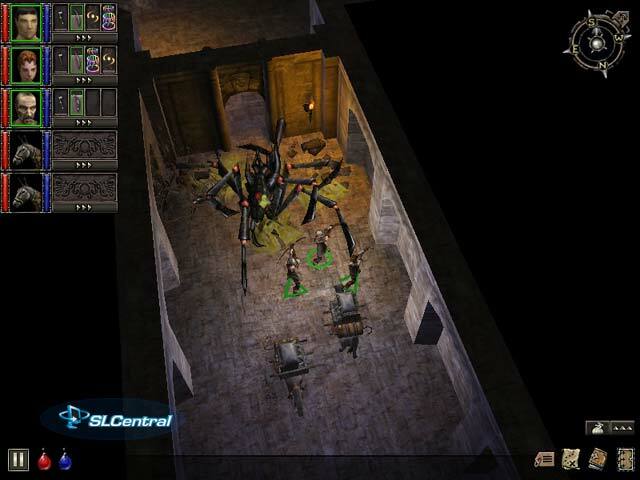 The gameplay in Dungeon Siege is very much like multiplayer Diablo. While your character starts the quest alone, before long you'll be recruiting new members to join your cadre as you sally forth through the Kingdom of Ehb. You can typically pick the "class" roles you want your characters to play with very little penalty, but you should also make decisions that are sensible. For instance, if you recruit a mage with an Intelligence of 19 and a Dexterity of 10, don't expect him to do a lot of bow firing. Generally, when you go to town to recruit followers, you'll have a few to pick and choose from to round out your ranks, so you won't ever be without. 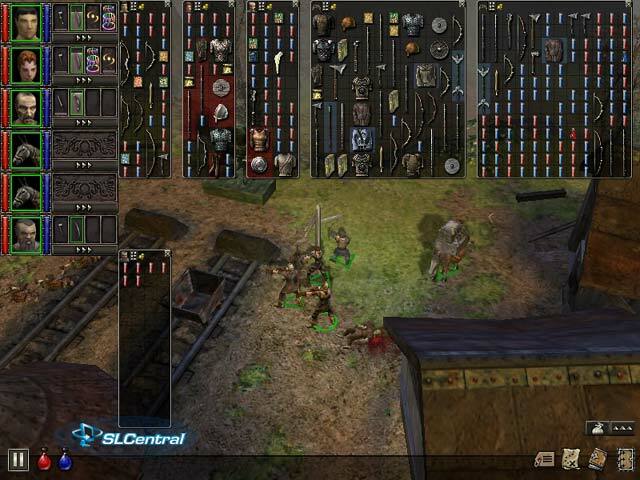 Characters in Dungeon Siege develop their skills as they use them more often. There are four separate classes of combat skills: Melee, Ranged, Combat Magic, and Nature Magic. Using any one area of these skills will advance your overall skill level in that field - This is mostly important for magic users, as many spells will require the caster to have attained a specific level of the appropriate magical discipline in order to cast the spell. Using any of these skills will boost all your stats, of course, but one in particular will rise much more quickly, dependent on the field. For instance, an archer will find his Dexterity rising much more quickly than the other stats. Ultimately, I would have liked for a bit more diversification in the physical attacking skills. Swinging an axe in battle is totally different from using a club or a scythe, for instance. Narrowing this down to a few weapon types would have been more appropriate. Another change Chris Taylor elected to make with the standard formula is concerning the inventory. Any Diablo player knows the rule of Town Portals. Once you've cleared a floor or area of baddies and maxed out your inventory, you fight a little longer, drop your high-value armor and weapons to be able to carry just a bit more, and then return to town to sell it all off. Chris found frustration with this method, saying that if gamers need more inventory, they should just have it. 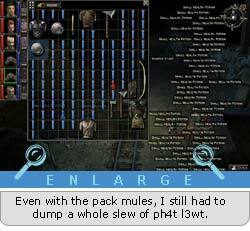 Thus, he added in pack mules to the game. 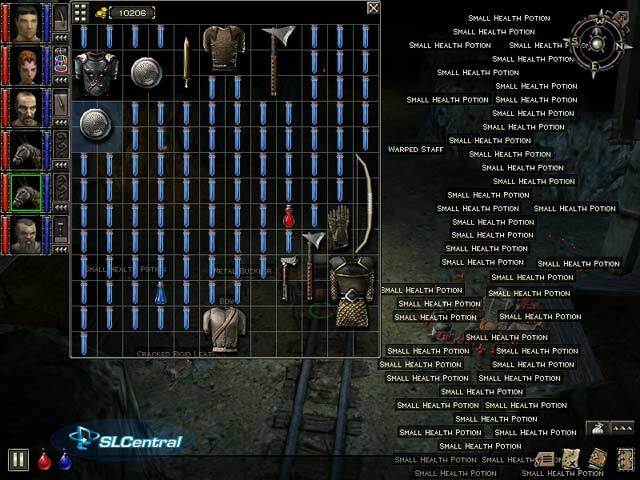 Pack mules act as another player character (and thus will permit you to have one less party member), except that they have about double the inventory space (when you figure in character equipment slots), and no stat boosting capability. That's not to say that they're useless other than being walking suitcases, of course. Pack mules will defend themselves in a fight, and gain more HP as you progress through the game. One really brilliant touch that Gas Powered Games made with this title was the inventory trading system - Allowing you to manage multiple inventories using the shrunk inventory screens and Ctrl-click makes things a breeze. Unfortunately, it's hindered somewhat by the game's inability to auto-sort items. While it does have a sort/shuffle function in the inventory, it'd be nice if the game would auto-fit items as you're exchanging them in the inventory. Unfortunately (depending on your view), Gas Powered Games seems to have made little effort to differentiate itself from the Diablo series when it comes to the inventory items themselves. You have basic item classes, each of which have varying degrees of quality (Worn, tattered, sharp, etc. ), and then an associated weapon/armor strength identifier. Beyond that, you have magically enhanced items, which, not coincidentally, appear in blue, and have "enhanced" names like "Conflicting leather greaves of perception" and the like, and have similar stat-altering traits to those you find in Diablo. Items you can't equip due to stat deficiencies appear in red. One really can't fault the developers for sticking with a working formula, but on the other hand, it isn't their formula, and it doesn't appear that they ever considered trying anything different. On the positive side, of course, all armor and weapons have an actual 3D representation in the game world, so your character's appearance reflects the individual pieces of equipment he/she is wearing, instead of a character generalization, as seen in Diablo. Managing combat is generally a breeze. You have a wide array of formation and behavior controls at your disposal, and many functions can be mapped to hotkeys for easy battle management. I usually found mid-battle changes to be unnecessary, but it is nice to know that I can easily change tactics during the battle should I deem it necessary. One downer to the whole concept is that the teammate AI is rather spotty. Quite often my party would come under fire, and I'd have to explicitly order a teammate to return fire. This led to a tendency on my part to make sure all my combatant party members were selected, in the event that I needed to attack or defend myself. Otherwise, combat is a joy. Dungeon Siege takes a lot of the micromanagement nonsense about battle and tosses it out the window. For instance, in Diablo II, you were forced to manually distribute potions to your hirelings to keep them healthy, or otherwise heal them yourself. 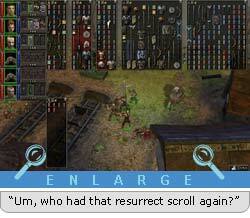 In Dungeon Siege, however, the lower toolbar contains two potion icons - one for health and one for mana. Clicking on either one of these forces all your party members to drink to their fill. If you're in battle, you're generally only concerned about those in danger of being knocked out, so Dungeon Siege smartly limits the drinking order to those with less than 50% HP remaining. Furthermore, while potions aren't stackable in inventory, characters only drink as much as is needed, and partial potions can be combined to take less inventory space. As far as the actual attacking goes, it's just as easy as Diablo - Point and click. Of course, one key difference is that you only need to click once. Since you can also hotkey each party member, assigning a varied combat strategy is as easy as key-click-key-click-key-click etc. Characters will stay in formation as allowed by their combat orders (Stand ground, pursue with prejudice, etc. ), and you can tighten or space them out as you see fit. It's all very well managed.